This post answers the question, “How do I consistently find top sales talent?” It will turbocharge your sales recruiting program by leveraging ‘social listening.’ It includes a downloadable guide to get you started. Social Listening is the proactive monitoring of indicators through social media. In this case, it’s used to identify passive candidates for sales positions. According to research by LinkedIn, 79% of their 225 million subscribers are passive – not looking to change jobs. Top talent is out there, and this program connects with them. It starts with identifying the key characteristics of your ideal hiring candidate. Those criteria are used to set up alerts in social media to identify potential candidates. The true power is to leverage the contacts in your own employees’ networks through referrals. Social listening is an effective way to staff for every position in your organization. But it is especially potent for sales positions. Sales people are experts at connecting with people outside to the organization to find new business. LinkedIn is their tool of choice. It allows them to quickly make the connections that lead to sales opportunities. So, top sales people are connected via social media. Connected to the people you want to hire. Sales people are also among the most expensive to hire. And among the most expensive to mis-hire. Leading HR departments start social listening programs with with open Sales positions. The current sourcing approach is often most broken in this area. And the potential gain is the greatest. Recruiters know how to get the most from LinkedIn Talent Solutions. They are experts at using the LinkedIn Referral Engine to mine their connections. They also charge hefty recruiting fees for this service. In spite of their professional skill, they the lack access you already possess. They are not connected to your firm’s employees. Social Listening gives you access to these priceless connections in a programmatic way. No external recruiter can do that. The math is in your favor, too. Here’s an example: You have 500 employees and they each have an average of 300 LI connections. That’s 150,000 people you can reach directly! You can search their profiles at the click of the mouse. Plus you have the ability to leverage established friendships and business relationships. HR leaders must do more with less. Think of how much you could save on the recruiting dollars you spend today. This program provides direct access to the kind of individuals that your organization needs. The downloadable Social Recruiting & Referral Guide provides the details on how to set up an effective program. Initial research into characteristics of top sales people in the company identifies 7 trigger events for a job change. One of these is the arrival of a new sales leader. A social listening system is set up to regularly scrape LinkedIn for announcements of newly hired sales leaders. An alert is generated that a competitive employer just hired a new SVP of WW Sales. A search of the LinkedIn connections of the sales organization identifies 5 candidates at the competitor firm who meet the top talent criteria. An email is sent to the employees who are connected via LinkedIn. They are asked to provide a personal referral. With warm introductions, the recruiter makes contact and stimulates interest with several of the target candidates. The ‘A’ player candidates listen and consider the new job opportunity. Two days later they meet with the hiring manager for an interview. They are excited to join the firm. This all assumes that HR recruiters are the most socially connected people in the organization. Start by connecting with everyone in the Sales organization. (Then expand across your entire organization.) This provides the ability to directly search the people in their networks. One of the first onboarding tasks for all new hires is to establish a 1st Connection with the HR recruiter. Your own people are the best route to hiring the next ‘A’ player. 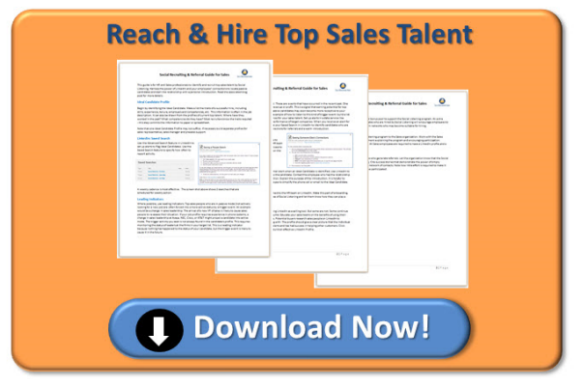 Download the Social Recruiting and Referral Guide for Sales. Start leveraging the power of the connections within your organization today. Read this article by my colleague, Steve Loftness for tactical ideas. If you need help setting up your program, contact me at John.Kenney@SalesBenchmarkIndex.com. Make Connections – Get Referrals – Hire the Best – Make the Number!